Born in Taiwan, Venerable Jendy was ordained as a bhikshuni in 1983 at Hsiang Kuang Temple. In 1987, she went to the USA where she received her Ph.D. in Education at the University of Washington. She translated for Ven. 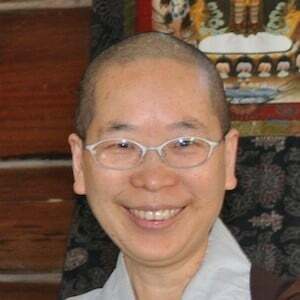 Bhikshuni Wu Yin at the program, Life as a Western Buddhist Nun, and also translated Ven. Wu Yin’s book, Choosing Simplicity: A Commentary on the Bhikshuni Pratimoksha . Ven. Jendy teaches at Chi Yuan Temple, the American Evergreen Buddhist Association, in Kirkland WA. Venerable Jendy is also a guest teacher.